The Colorado Plateau, also known as the Colorado Plateau Province, is a physiographic region of the Intermontane Plateaus, roughly centered on the Four Corners region of the southwestern United States. The province covers an area of 337,000 km2 (130,000 mi2) within western Colorado, northwestern New Mexico, southern and eastern Utah, and northern Arizona. About 90% of the area is drained by the Colorado River and its main tributaries: the Green, San Juan, and Little Colorado. 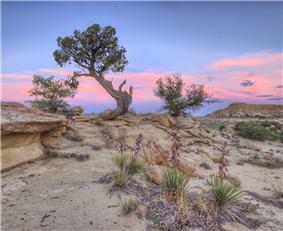 The Colorado Plateau is largely made up of high desert, with scattered areas of forests. 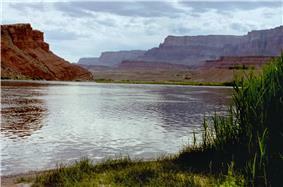 In the southwest corner of the Colorado Plateau lies the Grand Canyon of the Colorado River. 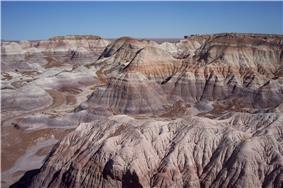 Much of the Plateau's landscape is related, in both appearance and geologic history, to the Grand Canyon. 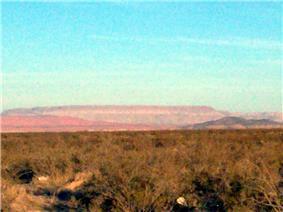 The nickname "Red Rock Country" suggests the brightly colored rock left bare to the view by dryness and erosion. Domes, hoodoos, fins, reefs, goblins, river narrows, natural bridges, and slot canyons are only some of the additional features typical of the Plateau. 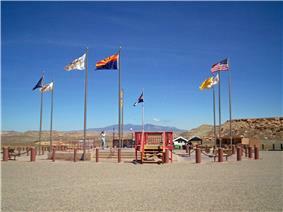 The Colorado Plateau has the greatest concentration of U.S. National Park Service (NPS) units in the country. Among its ten National Parks are Grand Canyon, Zion, Bryce Canyon, Capitol Reef, Canyonlands, Arches, Mesa Verde, and Petrified Forest. Among its 17 National Monuments are Dinosaur, Hovenweep, Wupatki, Sunset Crater Volcano, Grand Staircase-Escalante, Natural Bridges, Canyons of the Ancients, Chaco Culture National Historical Park and the Colorado National Monument. As the name implies, the High Plateaus Section is, on average, the highest section. North-south trending normal faults that include the Hurricane, Sevier, Grand Wash, and Paunsaugunt separate the section's component plateaus. This fault pattern is caused by the tensional forces pulling apart the adjacent Basin and Range province to the west, making this section transitional. Development of the province has in large part been influenced by structural features in its oldest rocks. Part of the Wasatch Line and its various faults form the western edge of the province. Faults that run parallel to the Wasatch Fault that lies along the Wasatch Range form the boundaries between the plateaus in the High Plateaus Section. The Uinta Basin, Uncompahgre Uplift, and the Paradox Basin were also created by movement along structural weaknesses in the region's oldest rock. 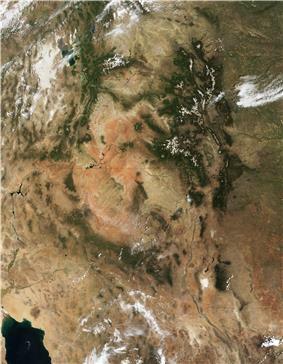 A rain shadow from the Sierra Nevada far to the west and the many ranges of the Basin and Range means that the Colorado Plateau receives 15 to 40 cm (6 to 16 in.) of annual precipitation. Higher areas receive more precipitation and are covered in forests of pine, fir, and spruce. 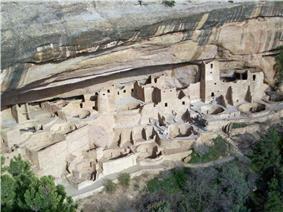 The Ancestral Puebloan People lived in the region from around 2000 to 700 years ago. Despite having lost one arm in the American Civil War, U.S. Army Major and geologist John Wesley Powell explored the area in 1869 and 1872. Using fragile boats and small groups of men the Powell Geographic Expedition charted this largely unknown region of the United States for the federal government. 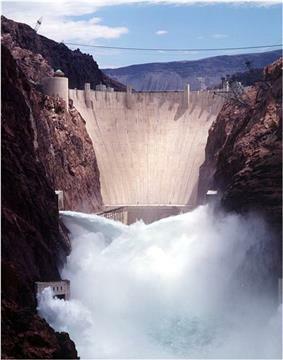 Construction of the Hoover Dam in the 1930s and the Glen Canyon Dam in the 1960s changed the character of the Colorado River. Dramatically reduced sediment load changed its color from reddish brown (Colorado is Spanish for "colored") to mostly clear. 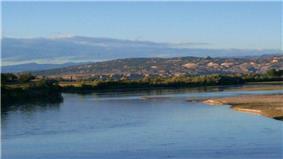 The apparent green color is from algae on the riverbed's rocks, not from any significant amount of suspended material. The lack of sediment has also starved sand bars and beaches but an experimental 12 day long controlled flood from Glen Canyon Dam in 1996 showed substantial restoration. Similar floods are planned for every 5 to 10 years. The Precambrian and Paleozoic history of the Colorado Plateau is best revealed near its southern end where the Grand Canyon has exposed rocks with ages that span almost 2 billion years. The oldest rocks at river level are igneous and metamorphic and have been lumped together as "Vishnu Basement Rocks"; the oldest ages recorded by these rocks fall in the range 1950 to 1680 million years. An erosion surface on the "Vishnu Basement Rocks" is covered by sedimentary rocks and basalt flows, and these rocks formed in the interval from about 1250 to 750 million years ago: in turn, they were uplifted and split into a range of fault-block mountains. Erosion greatly reduced this mountain range prior to the encroachment of a seaway along the passive western edge of the continent in the early Paleozoic. At the canyon rim is the Kaibab Formation, limestone deposited in the late Paleozoic (Permian) about 270 million years ago. A 12,000 to 15,000 ft. (3700 to 4600 m) high extension of the Ancestral Rocky Mountains called the Uncompahgre Mountains were uplifted and the adjacent Paradox Basin subsided. Almost 4 mi. (6.4 km) of sediment from the mountains and evaporites from the sea were deposited (see geology of the Canyonlands area for detail). Most of the formations were deposited in warm shallow seas and near-shore environments (such as beaches and swamps) as the seashore repeatedly advanced and retreated over the edge of a proto-North America (for detail, see geology of the Grand Canyon area). The province was probably on a continental margin throughout the late Precambrian and most of the Paleozoic era. Igneous rocks injected millions of years later form a marbled network through parts of the Colorado Plateau's darker metamorphic basement. By 600 million years ago North America had been leveled off to a remarkably smooth surface. The Laramide orogeny closed the seaway and uplifted a large belt of crust from Montana to Mexico, with the Colorado Plateau region being the largest block. Thrust faults in Colorado are thought to have formed from a slight clockwise movement of the region, which acted as a rigid crustal block. 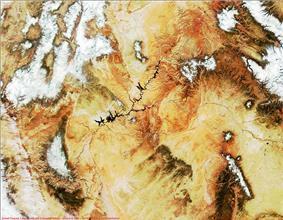 The Colorado Plateau Province was uplifted largely as a single block, possibly due to its relative thickness. This relative thickness may be why compressional forces from the orogeny were mostly transmitted through the province instead of deforming it. Pre-existing weaknesses in Precambrian rocks were exploited and reactivated by the compression. It was along these ancient faults and other deeply buried structures that much of the province's relatively small and gently inclined flexures (such as anticlines, synclines, and monoclines) formed. Some of the prominent isolated mountain ranges of the Plateau, such as Ute Mountain and the Carrizo Mountains, both near the Four Corners, are cored by igneous rocks that were emplaced about 70 million years ago. 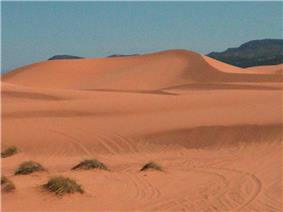 A second mystery was that while the lower layers of the Plateau appeared to be sinking, overall the Plateau was rising. The reason for this was discovered upon analyzing data from the USARRAY project. It was found that the asthenosphere had invaded the overlying lithosphere. The asthenosphere erodes the lower levels of the Plateau. 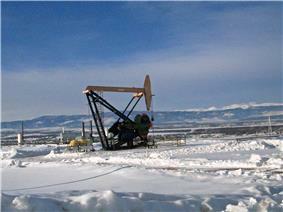 At the same time, as it cools, it expands and lifts the upper layers of the Plateau. 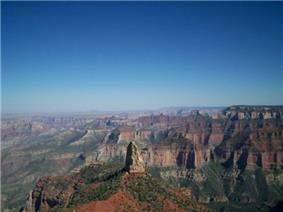 Eventually, the great block of Colorado Plateau crust rose a kilometer higher than the Basin and Range. 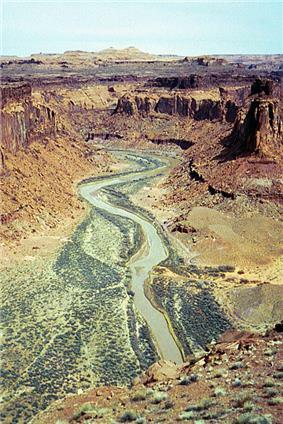 As the land rose, the streams responded by cutting ever deeper stream channels. The most well-known of these streams, the Colorado River, began to carve the Grand Canyon less than 6 million years ago in response to sagging caused by the opening of the Gulf of California to the southwest. This relatively high semi-arid province produces many distinctive erosional features such as arches, arroyos, canyons, cliffs, fins, natural bridges, pinnacles, hoodoos, and monoliths that, in various places and extents, have been protected. 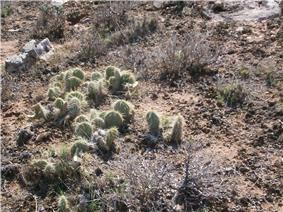 Also protected are areas of historic or cultural significance, such as the pueblos of the Anasazi culture. There are nine U.S. National Parks, a National Historical Park, sixteen U.S. National Monuments and dozens of wilderness areas in the province along with millions of acres in U.S. National Forests, many state parks, and other protected lands. In fact, this region has the highest concentration of parklands in North America. 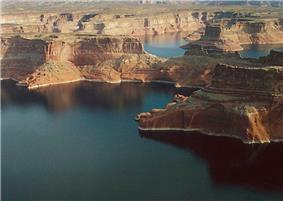 Lake Powell, in foreground, is not a natural lake but a reservoir impounded by Glen Canyon Dam. Other notable protected areas include: Glen Canyon National Recreation Area, Dead Horse Point State Park, Goosenecks State Park, the San Rafael Swell, the Grand Gulch Primitive Area, Kodachrome Basin State Park, Goblin Valley State Park, Monument Valley, and Barringer Crater. ^ Leighty, Dr. Robert D. = (2001). 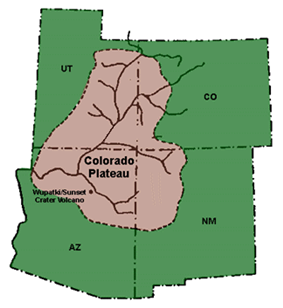 "Colorado Plateau Physiographic Province". Contract Report. Defense Advanced Research Projects Agency (DOD) Information Sciences Office. Retrieved 2007-12-25. 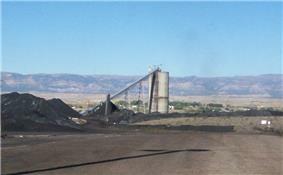 ^ a b Hawley, John W. "New Mexico’s Environment, Physiographic Provinces" (PDF). Retrieved 2007-12-25. ^ Geology of U.S. Parklands, page 374, "Trouble in Paradise"
^ For the whole paragraph except where noted: Geology of U.S. Parklands, page 383, "Precambrian and Paleozoic"
^ "Why is the Colorado Plateau Rising?". Geology.com. Retrieved 9 May 2011. Annabelle Foos, Geology of the Colorado Plateau, National Park Service PDF Accessed 12/21/2005. Look, Al, 1947, A Thousand Million Years on the Colorado Plateau, Golden Bell Publications, Fifth printing 1971, 300 pages. Stephen Trimble, The Bright Edge: A Guide to the National Parks of the Colorado Plateau. Museum of Northern Arizona Press, 1979.